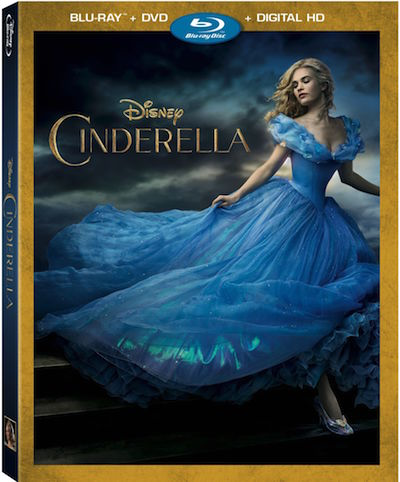 Disney’s beloved and empowering fairytale told in a new beautiful way, Cinderella, arrives on Blu-ray Combo Pack, Digital HD and Disney Movies Anywhere September 15th! The bonus features includes over 12 minutes of additional scenes, the "Frozen Fever" theatrical short and more! "Cinderella" is a modern classic that shines with beauty, imagination...and magic! Despite being mistreated by her stepmother (Cate Blanchett) and stepsisters, a spirited Ella (Lily James) resolves to take charge of her fate. Add a royal ball, a Fairy Godmother (Helena Bonham-Carter) and a glass slipper, and suddenly – magic becomes reality! And to celebrate, you can grab some free activity sheets to host your own royal ball! One Nanny to Mommy reader will win a copy of Disney's Cinderella on DVD/Blu-Ray/Digital HD! All you have to do is enter through the Rafflceopter form below. Giveaway is open to US only, must be 18+ to enter. Hosted By: Mom Does Reviews, Southern Krazed and It’s Free at Last! Welcome to the No Tricks, Just Treats Halloween Giveaway Hop! This Blog Hop is for fun Halloween prizes or Gift Cards. You could win a cute costume, candy, decorations or even gift cards and CASH! Nanny to Mommy received complimentary products to provide this review. No monetary compensation was received. Nanny to Mommy and participating bloggers are NOT responsible for prize fulfillment. This giveaway is open to US only, must be 18+ to enter. One entry per household/IP address. No social media was involved in this giveaway in any way. Winner is chosen via Random.org through Rafflecopter. ALL winning entries ARE verified. Winner will have 48 hours to respond with all information in email or another winner will be chosen. If you would like to see your product featured in our Holiday Gift Guide or sponsor a giveaway event, please contact Diana.n.chastain@gmail.com. I like the end when its the happily ever after for Cinderella. I also love the lion King. I like the glass slipper. I also like Beauty and the Beast. Our favorite part about Cinderella was she overcame an unfortunate situation and come out of it happier. Cinderella has always been one of our favorite movies. I always loved the glass slipper and The Little Mermaid is another great favorite. Me and my daughter just watched this and LOVED it! I think they did a fantastic job with this remake, and the girl who played Cinderella did an amazing job. Another favorite of mine is Beauty & the Beast, I am a huge book lover and so is Belle! I have always loved the Little Mermaid! I love the way Cinderella is still kind to her stepmother and stepsisters. My favorite part of this classic tale is when she loses her glass slipper. My other favorite movie is Snow White. I have always loved the glass slipper part of the movie, when the prince tried to find the owner. My favorite part of the movie is when the glass slipper fits! In the cartoon version of Cinderella, I love the part when the fairy godmother shows up! I haven't seen this version yet but I definitely need too asap! I love Beauty & the Beast! I also like Aladdin too! It's been a long time since I've seen Cinderella -- I didn't even know they updated the movie! I guess I like the whole finding Cinderella with the glass slipper part. I really like Lion King! I haven't seen this movie yet but my favorite part of the classic movie is when all the mice and animals make Cinderella's first dress. I also love Tangled. My favorite part is when Cinderella finally stands up to her step mother and gets her independence. In the stories, I always hated how she was treated by her step mother and step sisters so it always makes me happy when she is finally free. I haven't this new Cinderella movie yet. But what I do like about the tale of Cinderella is the great story. A favorite early Disney movie I really like is '20,000 Leagues Under the Sea' (1954). I think it's a fun adaptation from Jules Verne classic! I like when the Godmother comes to the rescue so she can go to the ball and I also like the Little Mermaid. My favorite parts were always the help of her little mice friends and the fairy godmothers. I love all of the classic disney movies, I'm so excited to have so many great ones to introduce to my daughter as she gets older. Cinderella has always been my favorite! My favorite part is when her fairy godmother shows up! My favorite Disney movie is The Jungle Book. Well I of course most liked when the prince took her to the castle. I really like all of the POTC movies as well and Maleficent! We love to watch the Lion King. The thing I love about Cinderella is that the message/theme is clean and wholesome. My favorite part is Cinderella arriving at the ball and dancing with the prince (magical). Another favorite Disney movie of mine is The Lion King. My favorite disney movie is probably Brave. I like the difference in story. I guess my favorite part of Cinderella when the fairy Godmother comes. I love the message of this movie! Another favorite is the lion king. I love the part where the prince takes the glass slipper around the village to find Cinderella. My favorite Disney movie is Beauty and the Beast. This may be a repeat but I love the ending! Another Disney movie I love is Tangled! I love the ending. I also love Tangled! I loved the character Cinderella's fun personality! I loved a lot of movies over the years, but I'd have to say Lady and the Tramp has always held a special place in my heart. My favorite part is the Clear see through slipper and all the aprts in the tale abot it! My favorite part of Cinderella is when she and the prince are dancing at the ball. My favorite Disney movie is Beauty and the Beast. I always loved how obnoxious the step sisters were lol!! It made you so excited when they werent the ones to get the prince in the end!! I am a sucker for Sleeping Beauty though and always will be!! I love how Cinderella is happy no matter what her situation is! We enjoy The Little Mermaid! When she gets to go to the ball! My favorite part is the glass slipper... I also love Beauty & The Beast. When she goes to the ball and dances with the prince. We love the Frozen movie too. I like the beautiful dress. We like pretty much any Disney movie. My favorite part of this story is when the fairy godmother turns her into a princess. Such a gorgeous gown! My favorite Disney movie is Sleeping Beauty. Thank-you for this exciting chance!! I love how it teaches patience and perserveance. I also love beauty and the beast. Beauty and the Beast is my favorite Disney movie. I think my favorite part of Cinderella is the pumpkin turning into a carriage. Cinderella is my favorite Disney movie.My favorite part is when the slipper fits. Cinderella is my favorite. I like the part where she puts on the slipper. My favorite part of the movie is when the glass slipper fits! I also love Beauty and the Beast. I love Peter Pan best.My favorite part of Cinderella is shoe part. I have always loved the moral of the story. Another favorite of mine is Snow White. I haven't gotten to see this version of Cinderella yet, but I love the story--both the animated one and the one that used to be on TV yearly (Stuart Damon and Lesley Ann Warren.) I also love many Disney movies--Lion King, Snow White, etc. My favorite part is when the fairy godmother gets her dressed up. My most favorite Disney movie is Sleeping Beauty. My favorite part about this story is those mice. Well, and the pumpkin, because you've always gotta love pumpkin. My other favorite Disney movie is Bambi. My favorite part is the ballroom dance. I also like Pocahontas. Thanks. My favorite part of Cinderella is when her Step family realizes that she is the one the Prince is looking for. Another favorite Disney movie is Mary Poppins. I love glass slipper when she gets it back. I also love Mulan. I love the message her mom left her with before she died. That kept her strong. I also love FROZEN. Just one of our favorite Disney movies is Peter Pan, we also like Oliver & Company too. My favorite part is when the fairy godmother changes her dress. My favorite part of Cinderella is when she walks into the ball and the prince sees her. Another Disney favorite is Ella Enchanted. My favorite part of Cinderella is when the slipper fits her and not her step sister. Pete's Dragon is another favorite Disney movie of mine. My favorite part of the movie is obviously the glass slipper. Another movie we really love is Aladdin! Our favorite part of Cinderella is when the fairy godmother comes and dresses her up for the ball. Also turns the pumpkin into a carriage. Bambi will always be my favorite Disney movie. I always loved her running down the stairs. Cinderella is the one my kids just love with her losing the glass slipper. One of my favorite Disney movies is Lady and the Tramp. The fitting of the glass slipper stands out for me and the magic of course! My favorite part about this movie is the fairy godmother and my other favorite Disney movie is Maleficent! I love the message, about being kind and having courage, I also like The Little Mermaid! I loved this movie in the theater. It was beautifully shot and the story was a bit different than the usual story. My favorite Disney? I don't think Hotel Transelvania is a Disney film so maybe Aladdin? From this movie, I love when the fairy godmother appears in the story. From any other movie, Disney's the Little Mermaid is my all time favorite! My favorite part of Cinderella is when the prince tried the glass slipper on her foot and it fit perfectly. oops...I forgot to say that another favorite Disney movie is Beauty and the Beast. My favorite part of this classic tale is when the mice and birds make the beautiful dress for Cinderella while she was doing all her chores so she could go to the ball. My absolute favorite Disney movie is Sleeping Beauty! My favorite Disney movie has always been the Little Mermaid. I love it. My favorite part is when the Prince finds her again. My favorite Disney movie is Beauty and the Beast. I love the essence of goodness in this story. Cinderella tries so hard to put others before herself, and not do it with a bad attitude, she does it out of pure love and respect for others. I also love The Little Mermaid. I love when her fairy god mom shows up and gets her to the ball. then she arrives at the ball and meets the prince. My favorite part is when the fairy godmother turns the pumpkin into a coach, the mice into horses and Cinderellas "rags" into a gown! I have loved Cinderella since watching the Rogers and Hammersteins version from the 60s. My grandmother taped it while it was on tv when I was little and I've loved the story ever since! It's such a classic story! My favorite part of the classic is all Cinderella's helpful critter friends. I have lots of favorite Disney movies, one of which is Emperor's New Groove. Thank you for the chance to win! My favorite part of Cinderella's classic tale is how it has a happy ending for her. She gets away from her mean step mother and sisters. I also enjoy watching Disney movie Aladdin. I really love Disney's Beauty and the Beast and their version of Robin Hood! My Favorite Part Of This Classic Tale Is It Ends With Happiness Forever! Another Disney Film I Love Is Lady And The Tramp. I just love Cinderella because it is a classic. My favorite is probably Enchanted or Tangled. I love the rags to riches story and the way the prince loves her even after learning that she is not royalty. My favorite Disney movie is The Little Mermaid. My favorite thing about Cinderella is that she's a sweet person who in the end gets all the happiness she deserves. I like a lot of Disney movies, it's hard to pick a favorite, maybe between The Lion King, Pocahontas, and The Nightmare Before Christmas. Beauty and the Beast is one of my favorites. Oh, and 101 Dalmatians. My favorite part of Cinderella has always been when the she is in her bedroom and the birds and mice come to comfort her. My favorite part of this version of Cinderella is when the Fairy Godmother shows up! She's hilarious! I also love when she turns everything into the coach and coachmen and horses. My daughter LOVES the mice in the movie and of, course Cinderella's dress! I forgot to mention the other favorite Disney Movie..... We love The Little Mermaid & Beauty and the Beast! My favorite Disney movie is The Little Mermaid. My favorite part of Cinderella is when the fairy godmother dresses her up and sends her off to the ball. I loved this! I saw it twice. I really love the set decor that they used in this version. I just saw this movie last night. I love the ending & how she forgives. I've always loved Mary Poppins. I love the characters of Cinderella and her wicked stepsisters. My favorite part of Cinderella is the dynamic between her, her stepmother and step-sisters. My favorite Disney movie is Beauty & The Beast. I don't have a favorite Disney movie. I love too many to have a favorite. My favorite part is when she tries on the slipper. Another favorite Disney movie for me is The Princess and the Frog. My fav part is when the glass sliper fits, I love beauty and the beast. I haven't seen this version yet! My favorite in the original Disney Cinderella was when she arrives at the ball. My other favorite Disney movie is Mary Poppins! My favorite Disney movie is Bedknobs and Broomsticks. My favorite Disney movie is Lady and the Tramp. I really liked that the animals still participated in this version. My favorite part is the sisters trying on the slipper then it fits her. I really like Mulan as a Disney movie. My favorite part is the fairy godmother and the dress. My other favorite disney movie is the Little Mermaid. I always loved Gus gus!!! My favorite Disney movie there are so many, I have always love Little Mermaid and Aladdin! I like the dress, and my favorite Disney Movie is Beauty and the Beast! My favorite part of Cinderella is when she enters the ball. My favorite Disney movie is Aladdin. Pocohontas is my all-time favorite Disney movie. The part I liked the best in Cinderella is when the prince comes with the slipper to try it on. My FB name for today's comment is Stephanie Compton. It has to be the beautiful dress! My favorite is Mulan. She's the type of Disney Princess who actually rescues herself. One of my favorite parts of Cinderella is when the mice finish the dress and surprise her. I love so many of the classic Disney Movies, both animated and live action. One of my many favorites is Toy Story. My favorite part of Cinderella is the mice and Fairy Godmother parts. I also like Beauty and the beast. My favorite part of this tale is when the mice come out to play with Cinderella in the attic. My all-time fave Disney movie is Mary Poppins. I love qhen the godmother shows up and gives her the dress , glassslippers etc. I also love snow white. My favorite part is the Bibbidy Bobbidy Boo song. I used to sing it to my son when he was a baby. From the classic tale, I love that the stepmother and stepsisters don't win in the end. Cinderella, kind and friendly, gets her night at the ball and the happy ending. From this movie version, I absolutely loved the costuming! It's all so beautiful and detailed. We adored this movie. Have Courage and Be Kind! We like the old one too. My favorite part of the classic fairy tale, Cinderella, is the transformation scene, when the Fairy Godmother changes Cinderella's rags into a beautiful gown! I also love the classic Disney animated film, Sleeping Beauty. I always like the ending in Cinderella where she no longer has to live with the step sisters and is saved by a prince. Another Disney favorite is The Jungle Book. My favorite part is when the animals and mice sing and come together to help her make her dress to go. My favorite is the one little mouse that calls her "Cinderelly". Our favorite Disney movie is Lion King. I like when the animals and mice sing and help make her dress. I really like the little mouse that calls her "Cinderelly". Our favorite Disney movie is The Lion King. One of my favorite parts is when the wicked step sisters are so mean to Cinderella she does not treat them badly, and in the end Cinderella gets her man and wins the day. my favorite part is when she gets to got to the ball. Another one of my Disney favorites is beauty and the beast. I love the end when Charming finds Cinderella! OMG SO ROMANTIC! I also loved the little mermaid! My favorite part of Cinderella is when the fairy godmother transforms her dress. I love Aladdin and the little mermaid. I love the idea that kindness is rewarded in Cinderella. I love the happy ending, of course! I haven't seen this version of Cinderella before. My favorite Disney movie is Tangled. My favorite part is that Cinderalla eventually finds her prince. I also like Snow White and Seven Dwarfs movie. The Fairy Godmother is my favorite part of this movie. I also like Mulan. I always loved Cinderella because my name is Cindy. I love the part when the Fairy Godmother gives Cinderella a beautiful dress. Another favorite Disney movie of mine is Aladdin.